Gist: Not competitive with marquee phones like iPhone 4s or nexus prime, but a great buy. Maybe Nokia isn't going high end until the wp7 app market is competitive... Or maybe they just need a full development cycle to produce marquee hardware. Nice discussion of the wp7 design trade offs. Wp7: great aesthetics but low information density, and non obvious ui. Android: poor aesthetics, but good density and better affordances. I think this different experience may be a good one for wp7. 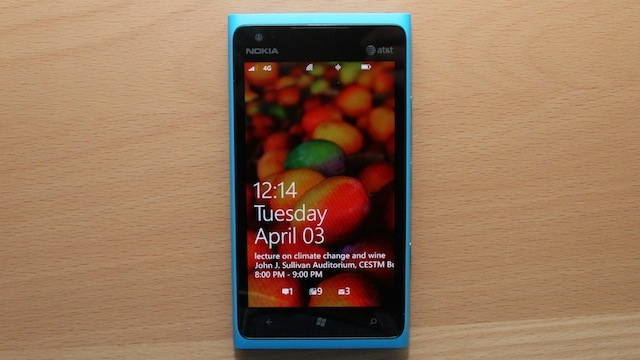 The Nokia Lumia 900 has the weight of two big names on its shoulders. It's Nokia's big re-entry into the US market; it's also the flagship Windows Phone Mango in this country. In anticipatory articles, you can hardly find the term "Lumia 900" separated from the word "premium." The phone is as important as the Samsung Galaxy Nexus was to Android 4.0 Ice Cream Sandwich and as, well, every new iPhone is to iOS. The phone was recently announced at the two-year contract price of $99, a tag usually applied to new mid-range or old high-end phones (even more recently, AT&T announced the Lumia 900 will be free online for new customers). But the implication is that the low price is meant to attract attention to an OS that has yet to win a significant chunk of the market. It's not a reflection of the handset's quality. Because of this, we largely compare the Lumia 900 to the two flagship phones of the other two major OSes, the iPhone 4S with iOS and the Galaxy Nexus with Android 4.0. The iPhone 4 also makes a brief appearance, since it has the same list price as the Lumia 900.